Ceratosaurus nasicornis. Cretaceous period. Hand made note cards feature photographic reproduction of Josef Moravec's oil paintings. On the backside of the card is a description (such as weight, size, time, diet). * Great as Invitation VIP Cards for Museum of Natural History Dinosaur Parties. 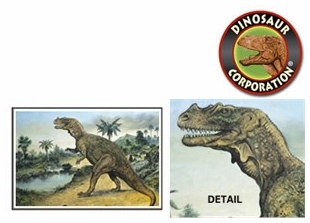 For bulk prices on large quantities contact us at Dinosaur Corporation Our customer service will reply within 24 hours.